I'm a natural planner, but over the past year or two, I've been trying to loosen up and just write, as I've shared here before. But, at least for me, even when I'm letting the story lead me step by step as I'm writing it, I like to still have in my head the big beats I need to hit and where I hope to arrive at the end. I've also tried to press into character arcs as an equally important motion of the plot. 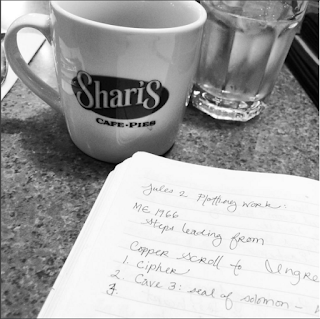 As I've been working on my current project, I've discovered an approach that is giving me what seems to be the perfect balance between plan and discovery and between plot and character. I've been wanting to share this technique with you, and it makes a nice dovetail to Chris's post last week on layering plot and character in story. 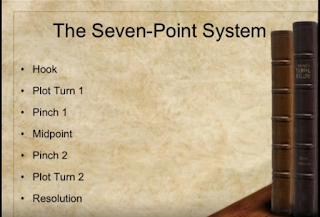 You may have heard about seven point plot structure before. It's kind of a hero's journey lite, if you're familiar with that approach. I heard about seven point plot structure from a writer friend, but when I looked it up, the blogs I found only confused me. Hook? Pinch Point? Plot Turn? The descriptions were vague and uninspiring. But then my friend directed me to the videos of Dan Wells presenting at a writing symposium using the seven points for story structure. If you want a quick master class on writing, I encourage you to set aside forty-five minutes and take yourself out to coffee with headphones, a laptop, and this link. 1. Figure out how you want the story to end (Resolution). 2. Create a beginning with an opposite status quo (Hook). 3. The middle should be when your character makes the deliberate choice to pursue the Resolution (Midpoint). 4. Set the character in motion from the Hook toward the Midpoint. Call them out of the status quo and introduce conflict (Plot Turn 1). 5. Get the character the last and most important thing they need to accomplish the Resolution (Plot Turn 2). 6. Apply pressure, force your characters to action, and create hurdles to their goals on either side of your Midpoint (Pinch Points 1 and 2). This is pretty straightforward stuff. It's a way to do it, and it pretty nearly encompasses most story-telling from a western worldview. 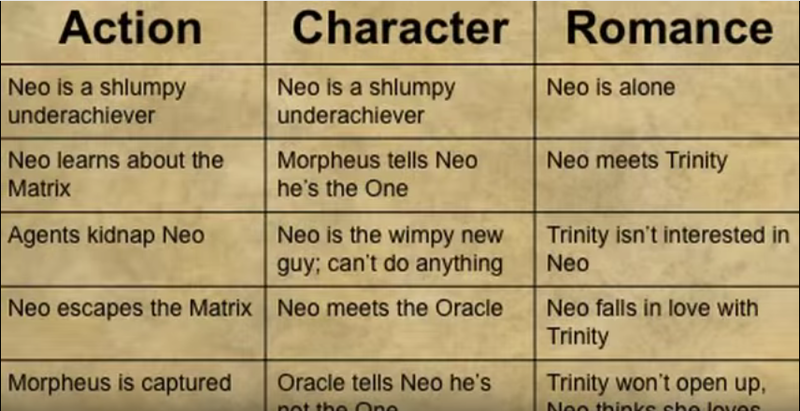 What I like most about Wells's presentation is when he takes the character arcs, main plot, and subplots (using The Matrix as his example) and charts where each point of the the story structure occurs for each one and how they then weave together in the chronology of the story. 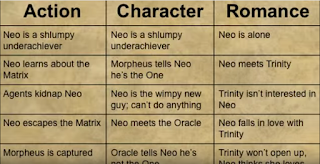 This got me excited and it got me thinking about how seven point plotting takes shape for characters, something Wells doesn't have time to fully unpack during his presentation. I understood the idea of a Hook to Resolution arc for any character, but the finer details evaded me. I had to dig a little deeper to understand what a Midpoint would mean for a character arc. That's when I discovered this excellent series of posts by K.M. Weiland. She argues that in the beginning of a story, the hero is operating from a lie about who they are, what they are capable of, or what the world is like. This lie shapes who they are and how they are. The Resolution for that character will be to reject the lie and learn, accept, and live out the truth instead. So, then, the Midpoint is when the character is able to finally see and accept the truth, but still has not rejected the lie or its effects on their choices. This enlightens the rest of the seven points for character arc. The Plot Turns introduce the truth, expose the lie, and give the character what they need to reach the Resolution. The Pinch Points refute the truth, reinforce the lie, and create barriers to the character's journey to truth. Brilliant stuff, right? To have this internally-driven structure woven into the externally-driven one allows for complexity, ingenuity, and well-rounded characters amidst a satisfying story. 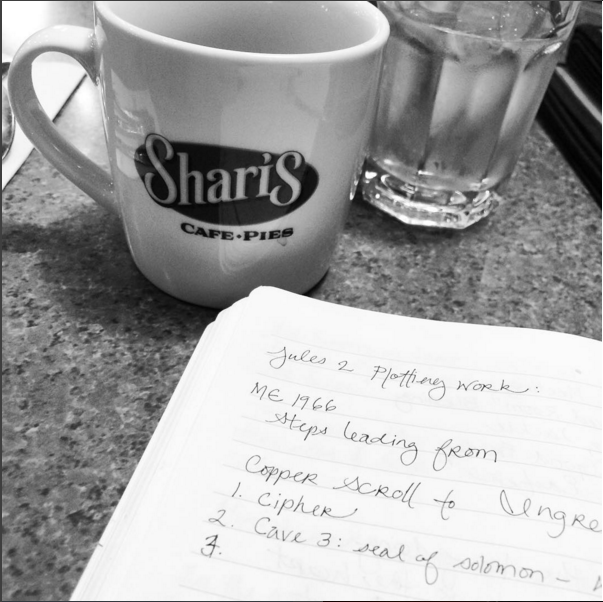 As I'm drafting a novel right now, the seven plot points are really helping. Some of the story points will happen simultaneously with character points, but some will occur separately. Many of the points are already clear scenes in my mind. But there are so many other scenes and so much happening between the points in order to get the story there, they serve more as guideposts than outline. It's definitely pacifying my inner Hermione Granger who needs to have answers, but it's giving spaciousness for the story to open itself to me as I write it. I'm loving that balance. 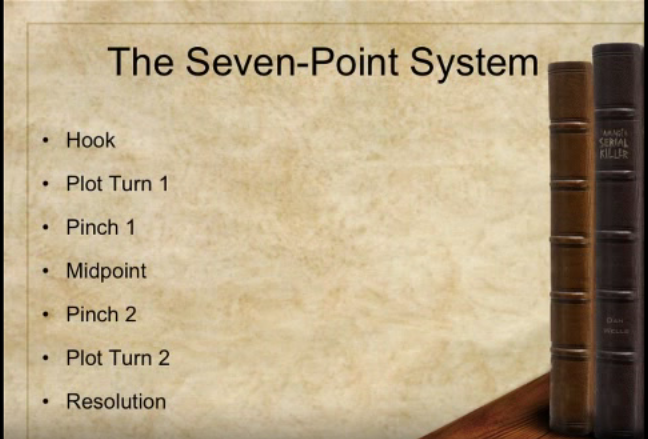 Have you used seven point plot structure before? Have you applied it to character development? Have you encountered other teachers/bloggers/writers who have an approach to it that you've found helpful? Please share in the comments below! Great post and really helpful! What a fantastic post. I feel like I'll always struggle with structure, but resources like this help! I love that you have an inner Hermione Granger, and that this way of working is pacifying her. I can't wait to have time to explore Dan Wells' and K.M. Weiland's presentations. In the meantime, thanks for the clear summary. Great post. There have been so many excellent posts here of late! Saving this (and others) as links to later share at my blog. Adding this to my class resource lists! Thanks all! Glad it's helpful. Whenever I discover a new approach, I always assume I'm the last one to the table and wonder if sharing would be redundant for most. Really pleased it's been a good resource for you!